We do not have the budget to hire all of the people we need. But often, there is a solution to these problems hidden in plain sight. And that is your current workforce. Many smaller businesses do not have the same hierarchical structure that most large companies have put in place. This is a good thing when it comes to managing a team, but it can create functional boundaries that make hiring and professional development more difficult. Because there is no clear upward path to new roles within the organization, your people often reach a plateau, wherein they can either look for new challenges outside of the organization or they can stagnate right where they are. But new project, new priorities, and new strategies bring with them an opportunity for you as a manager to rediscover the talent on your current roster. Rather than immediately planning for an external hire to fill the new role in your plans, think about who you can tap internally. Chances are, there is underutilized talent in your organization just sitting there, waiting to be discovered. 1. Cultivate it over time. In order to encourage the talent that you already have to continue to grow and develop professionally, you should make that a regular part of working for your organization. Give people access to professional development opportunities throughout their tenure and follow up with those that take advantage to find out what they learned and how they enjoyed it. 2. Be transparent about future plans. In order to give people the best chance of future success, it is important to be open and clear about where the company is going. When people know the types of roles and positions that are likely to be necessary in the future, they can begin to prepare and adapt to those roles today. This kind of thinking can guide their professional development, ensuring that they end up with the right types of skills the company will need tomorrow. Don’t sit by and assume that people will on your team will raise their hand and volunteer to take on new tasks. But incentivize them to do so. If your company does not have a traditional path to promotion, you need to motivate people to think outside the box. Encourage moves within and across departments with financial and non-financial incentives. To ensure that you don’t lose institutional knowledge when someone moves to a new position, it should be a regular practice within your company to make sure at least two people know how to do any one task. This also creates a sense of shared responsibility which can help teams grow closer. When each person is responsible to making sure that others are knowledgeable about their roles and assignments, we can eliminate some of the boundaries that make hiring and training so difficult. Human beings are naturally risk-averse, meaning they like to control the amount of risks they take and avoid them if at all possible. It’s what helped our ancestors survive. But in the business world, risk aversion is a dangerous thing. You don’t succeed without taking risks. The world’s most successful companies were all built on risk. And the most successful leaders are those that know which risks are worth taking, and when. So if you are someone that is not comfortable with risk, does that mean that all hope is lost? Should you pack up your desk and find a new job, one that does not force you to take any risks (like that exists)? Obviously, the answer is no. There are ways that you can train yourself to see risk differently. You can become more comfortable evaluating, and taking, risks in your company. The best way to start to evaluate risk is to clearly define it. This is helpful for you, and for anyone else you are working with. By clearly defining the decision that you have to make and what the risks associated with it are, you set the stage for clear thinking. Without this step, you might approach the problem more vaguely and end up scaring yourself out of making a decision. Next, you’ll want to clearly describe for yourself what success would look like. Approach this as if you have already decided to move forward and the project succeeded. This helps you understand what a positive outcome will look like. Too often when we are risk-averse, we spend all of our time thinking about the potential failure and do not focus nearly enough energy planning for success. Now, only after you have defined what success will look like, will you turn to the opposite track. Write down in detail what failure will look like. The advantage of doing it this way is that you can create a more realistic version of failure. Often, we approach risk by immediately going to the worst-case scenario. But the truth is, more often than not the worst-case scenario is one that is unlikely to happen. Next comes the most difficult part – the part that trips up a lot of people. But it doesn’t have to trip you up. You want to try to estimate the odds of success (the version you defined in step 2) and the odds of failure (the version you defined in step 3). The temptation is to say the odds are 50/50. But most decisions, if we are being honest with ourselves, don’t have 50/50 odds. Sometimes a risk is more likely to pay off, sometimes not. And sometimes there is an in-between outcome, somewhere in the middle of the success and failure you’ve described. The closer you can come to the odds of each version coming true, the more comfortable you will be with the final decision. Lastly, there is a step too many of us leave out entirely. In most decision-making scenarios where we are weighing the risk of moving forward, we ignore the alternatives. Usually, if you decide to move forward and take the risk, you are giving something else up. There is only so much time in the day, only so much money in the budget, and only so many priorities we can work on at any given time. Additionally, if you decide not to move forward because there is too much risk identified, you may end up asking yourself what to do next. Identifying the alternatives to this risky endeavor may make it easier to say yes or no. When you are all done defining the risk, describing what success and failure look like, calculating the odds and identifying the alternatives, it’s time to make a decision. Don’t let perfect be the enemy of the good. If you have a tendency to stagnate, to get paralyzed by the decisions before you, commit yourself to a deadline. Don’t let yourself ruminate. If you need to, bring in one or more trusted stakeholders to help you forward. Because the truth is, any decision is better than no decision at all. Hiring is not easy. But it is a critical part of growing a successful business. Time and again we find that the most productive or the most innovative organizations are the ones with highly competent, diverse teams. At the end of the day, it starts with the people in your company. And hiring is hard enough when you know exactly who you need. When you have a detailed list of tasks and responsibilities that someone will need to do once they get hired, with a clear title and vision for where and how this person fits into the organization, it makes your job much easier. But what happens when none of those things is true? Sometimes you just need to hire someone. You know that there are things that need to get done that aren’t, either because you don’t have enough time or enough know-how. Your team is stretched too thin and you need to add another player to meet your growth targets. What are you hoping to accomplish this year? What new initiatives do you have planned? How do you plan to grow the business? These kinds of questions are the ones you will answer in your strategic plan. If you don’t have a strategic plan, I recommend starting there. You need a roadmap that details how you plan to get from A (where you are today) to B (where you want to be in 1-, 5-, and 10- years). A careful review of your strategic plan will highlight key areas you need to pursue. Once you have reviewed your strategic plan, you must review your existing team. Match people up with the plan, highlighting their current skill sets and where they can continue to add value. In most organizations, this will reveal certain gaps. These gaps are areas where you don’t currently have the right people to do the job. Perhaps there are skills or sets of experiences that your team is missing. This will clue you in to what a new hire should add. It’s possible that you are working in uncharted territory. Perhaps you have many different gaps and aren’t sure how to prioritize them. It can help to take a look at what other companies are doing. Look to peers in the industry, even competitors. Find out who they are hiring, and how they are planning to grow and succeed. Often this will open your eyes to the types of positions needed to achieve your goals. Whenever the hard skills for a position are not well-defined, you will need to rely on soft skills. You are going to look for someone who fits well within your existing culture, someone who is passionate about the company and its mission. You also want to find someone who has demonstrated the ability to learn and grow professionally. This person should have strong creative thinking skills, as you may end up relying on them to define their role and think up new ways to add value. Hire the best person available and design the role to fit them rather than the other way around. The exact responsibilities that this person has on their list might change over time, but if you have the right person, everything else should fall into place. A common myth abounds in business circles – the myth that good decision makers are born, not made. Untrue. If we are honest with ourselves, we know that we can become better decision makers through experience and practice. Think about it right now. Are you better at making decisions than you were ten years ago? Chances are the answer, no matter how old you are, is yes. As a leader, you are not just worried about your own decision-making ability. You are also worried about the ability of your team members make decisions individually, and your team to make decisions as a group. You want to lead a team that knows what they are responsible for, that knows the criteria for good decision making, and can be trusted to make decisions that are in the best interest of the company. That is the only way for you, as a manager, to trust them. And you need to trust them in order to empower them, and develop the kind of effective team you need to succeed. The key to any decision is putting it into its appropriate context. For a company, there should be a common set of goals that we are all working toward. Clear and transparent communication around these goals is key to framing every decision. When confronted with a decision, large or small, we want our employees to ask themselves one simple question: How will my decision impact the company? The answer to this question is not always obvious. For example, if I’m asked to choose between building out a marketing capability in house or outsourcing it to an agency, it is not going to be clear right away with option is better for the company. But if I know that one of our goals is to take more ownership over our growth, I know that building out a capability is a better fit for who we want to be as an organization. You want your team to think about the outcomes of their decision. Will this help or hurt the company en route to its larger goals? And you can help them do that by being open about what those goals are. We all make mistakes. As managers, we don’t like to advertise that fact. We like to pretend that we got to where we are today by making all the right decisions and actions along the way. However, the truth is far from those perfect versions of ourselves. We stumbled and took missteps along the way. And yet, here we are. As a manager, the first step to empowering your team to make better decisions is empowering them to make more decisions. And you have to get over your fear of failure, which we all harbor. Your team will make the wrong decision sometimes. And that has to be okay. While we should not encourage failure, and we should address each one and learn from it, we have to admit that failing happens sometimes. It’s the only way to instill a sense of trust and openness on your team. And it’s the only way anyone is going to learn to improve going forward. The last thing you need to do to encourage your team members to become better decision makers is to teach them to evaluate the decisions they make. This is a time for learning and growth. We should evaluate all decisions – large and small. We should evaluate our winners as well as our losers. There is always something to learn. In some cases, evaluation is all about examining the results. What went well? Did we meet expectations? What happened that we did not anticipate, and should we have seen that? Through these decision post-mortems, you will learn to appreciate the things that are outside of your control, and to see the things that you do have control over. Each decision going forward will build on the decisions of the past. And the more we understand – through careful practice and honest evaluation – the more prepared we will be to make better decisions in the future. From the list above, do any of the incentives stand out to you? Can you think of any reason why those incentives should not be in place? On first look, they all seem to make sense. A social media manager should aim to grow the reach of the brand. A search engine marketer should take efforts to lower marginal costs. An email marketer should push for higher engagement. And a sales manager should value his team’s ability to close more sales. But remember, what you measure matters. And if an employee at any level of the organization has all or part of their pay tied to certain metrics, those are the metrics that will matter to them. Even if they are not metrics that are tied back to the overall performance of the company. That in mind, let’s find the problem with each of the above incentives. A social media manager who receives a bonus based on growth in total followership. This is all well and good except that how do we know that followership helps the business? You can increase followership by spending money to promote the brand page, or by buying lists. But that doesn’t mean it’s going to lead to an increase in brand engagement, loyalty or sales. Wouldn’t it be better to measure something that ties revenue back to social media activities? A search engine marketer who receives a bonus based on lowering cost per lead. While it might be good if a business drove more leads for the same amount of money, who is to say that those leads will be of the same quality. You can drive down lead cost by bidding on weaker terms, or spending more money on lesser search engines or content networks. That doesn’t mean that sales and revenue will go up as a result. Wouldn’t it be better to measure profitability of the advertising dollars over time? 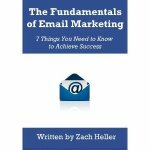 An email marketing specialist who receives a bonus based on open and click thru rate improvements. One might assume that more people opening and clicking on your emails is a good thing, but not if those people don’t end up becoming customers. The ultimate goal of any email campaign is not just an open and a click. It’s something else – a donation, a sale, a referral, greater loyalty or retention. Wouldn’t it be better to measure those outcomes? A sales team leader who receives a bonus based on conversion rate of leads to sales on outbound sales calls. This one seems like the most reasonable at first blush, but it too has its issues. One way to get to a higher conversion rate would be to pre-sort prospects and call only the easy sales. Another way would be to apply aggressive tactics over the phone in an attempt to pressure more people to purchase. These efforts can lead to lower sales and satisfaction, and higher cancels and refunds down the road. Wouldn’t it be better to measure a lifetime revenue metric and aim for higher total revenue per dollar spent on selling/calling? Aligning individual incentives to the larger company goals is the only way to make sure everyone is working toward the same mission.